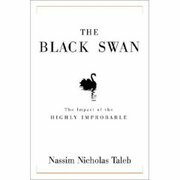 Now that I'm finished reading Nassim Nicholas Taleb's latest classic, The Black Swan, I need to take a few days off to let my brain decompress. Taleb is brilliant and his writing style helps the reader look at trends, markets and information in general in a completely new manner. I read Taleb's previous book, Fooled by Randomness, earlier and there are plenty of correlations between it and The Black Swan; you don't need to read Fooled by Randomness first, but it provides a good foundation for what you'll find in The Black Swan. What's so special about Taleb and his books? He's a master storyteller and seems to have an excellent example for every point he's trying to make. Most authors couldn't pull off the cynical and oftentimes sarcastic approach he takes; I find it one of the most entertaining and engaging aspects of his work. I love the way he's able to pinpoint the poor logic that we're all guilty of at one time or another and how we often hear only what we want to hear. For example, he notes how when a doctor says "there is no evidence of cancer" we often misinterpret that as "there is evidence of no cancer"; obviously there's a huge difference between the two, but the latter is impossible to state with 100% certainty. Our inability to predict in environments subjected to the Black Swan, coupled with a general lack of the awareness of this state of affairs, means that certain professionals, while believing they are experts, are in fact not. Based on their empirical record, they do not know more about their subject matter than the general population, but they are much better at narrating -- or, worse, at smoking you with complicated mathematical models. They are also more likely to wear a tie. In that one paragraph you get a great feel for the biting commentary Taleb provides throughout this excellent book. That, and a bit of humor at no extra charge. (In the pre-computer days)...the activity of projecting, in short, was effortful, undesirable, and marred with self-doubt. But things changed with the intrusion of the spreadsheet. When you put an Excel spreadsheet into computer-literate hands you get a "sales projection" effortlessly extending ad infinitum! Once on a page or on a computer screen, or, worse, in a PowerPoint presentation, the projection takes on a life of its own. It is often said that "is wise he who can see things coming." Perhaps the wise one is the one who knows that he cannot see things far away. If you're interested in the book publishing world you'll find The Black Swan particularly fascinating. His stories and examples feature numerous observations of book publishing, best sellers and market dynamics. Regardless of what business you're in or hobbies you have, The Black Swan is an wonderful book that will cause you to re-think all your assumptions.